As is usually the case with to-do iPad apps, Todoist is designed to work with the Todoist service, so it doesn’t sync tasks over iCloud or Microsoft Exchange. The app is free, as is the basic service, though you must sign in with your Google, Facebook, or Todoist account. If you want to be able to add labels or set up reminders, you need to upgrade the $29-per-year premium service. Business accounts are also available that let work groups share task lists. The Todoist app lets you view your tasks organized as projects or filtered by priority, assignee, or date. 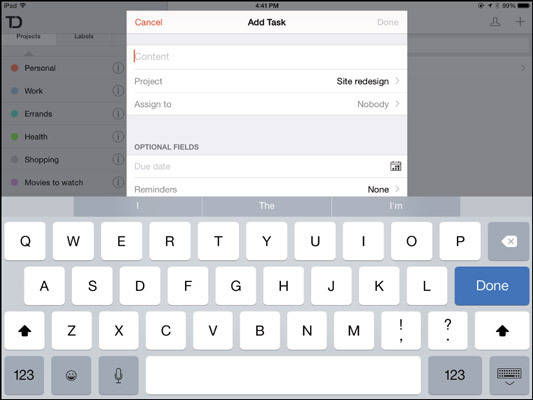 In the left part of the screen, tap Reports or Filters to decide how to view your tasks. The concept of organizing projects is what makes Todoist stand out. You can create projects and subprojects, a structure that lets you organize your tasks in ways many to-do apps can’t. You can break a project into several component groups. Likewise, you can set up subtasks for your tasks, meaning that you can show the various parts of a complex task — subtasks — as separate entities, yet keep them grouped with the overall task they belong to. Scroll to the bottom of the left side of the screen. Enter a name for the project in the Name field. Set the Sub–project field to your choice of No (not a subproject), Level 1, Level 2, or Level 3. (Optional) Set the color for the project or subproject using the Color menu. Tap Edit at the bottom of the project list. Drag the projects and subprojects so that the subprojects are under their parent projects, and in the order you want them. 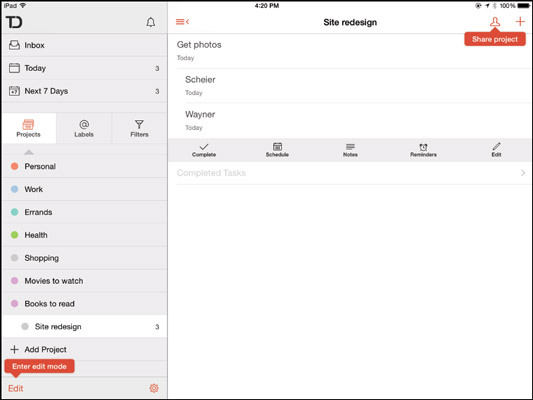 When editing the project list, tap the Details button (the i icon) to edit a project’s attributes. You also delete it (and any task entries) here by tapping Delete Project. Adding a task in Todoist is easy: Just tap the Add button (+ icon) in the upper right of the screen. When you do that, a form pops up where you enter the salient details, including the task details and the project to store it as part of, as well as the optional aspects: due date, priority level, and subtask level. Also, if you’ve subscribed to the Premium service, audible alarms (a.k.a. reminders) or labels, you enter those details here. Tap Done when you’re done.